The moon shone, a white orb in the sky above the parking garage rooftop in Asheville. 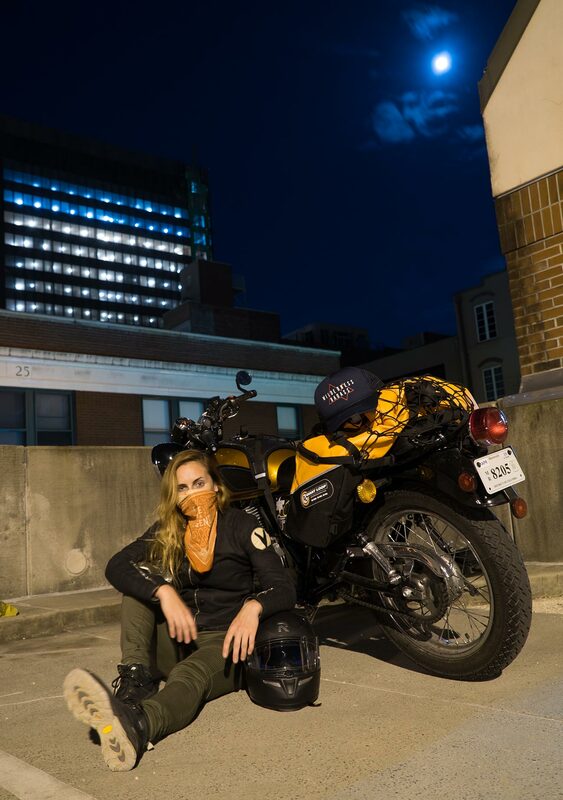 Nelson and I sat in empty parking spaces, our adventure vehicles parked haphazardly across spaces in front of us, cherry tobacco smoke pouring from the corncob pipes were were smoking. It was Monday night in North Carolina, the kind of night that stays warm and makes you want to stay up late, a few clouds in the sky and the buildings illuminated by the moonlight and street lamps. It was a start, a start to the trip south to Patagonia— meeting another adventurer and winding up here on the rooftop, with the sole purpose of taking the coolest photos of Nelson’s Taco (Tacoma truck) and my motorcycle, smoking mountain pipes and talking about the kinds of lives we wanted for ourselves and the world around us. It’s what I love the most about traveling, that ability to roll up to an unknown place full of unknown people and become friends, to surrender to the moments and try new things, and find new facets of yourself you might not have known were there in the humdrum of routine and home. The coolest photo we could fathom. I had to wear the bandana because I kept laughing and smiling, which isn’t cool obviously. The trip started with surrender, the way plans often do. I was already starting out a week late, a week after the beautiful weather on the east coast turned to cold rain. Dark clouds had been in the sky all morning, but there were a few hours the rain was supposed to stop and I had planned to make my escape. I had gotten my Giant Loop bags just two days before, and was test driving the bike loaded for the first time as I was leaving, double checking (triple checking) the suspension and the tire pressure, before I headed down the road toward Gaithersburg— the skies ominous but the smell of freedom in the air. Just outside of DC I hit rain— pant soaking, chill you to the bone rain, slapping against my jacket, against my face shield. 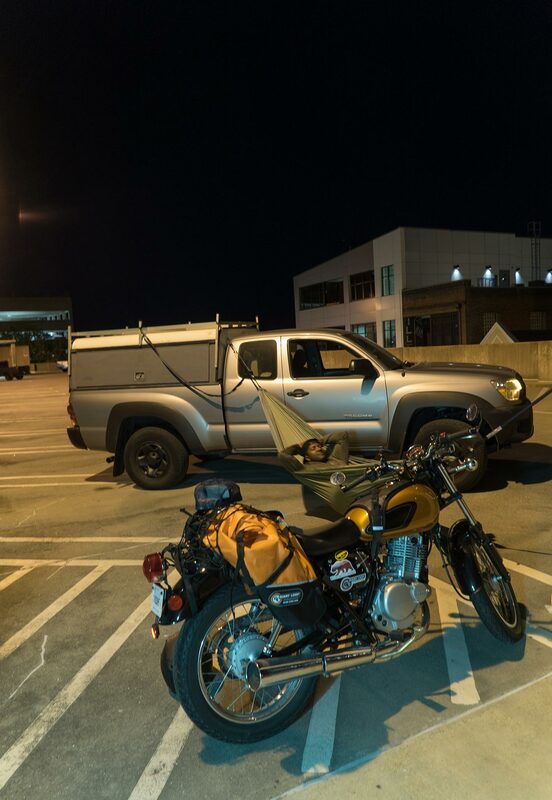 My goals of camping in Shenandoah deteriorated when after just 2 hours of riding I had to stop for the night. 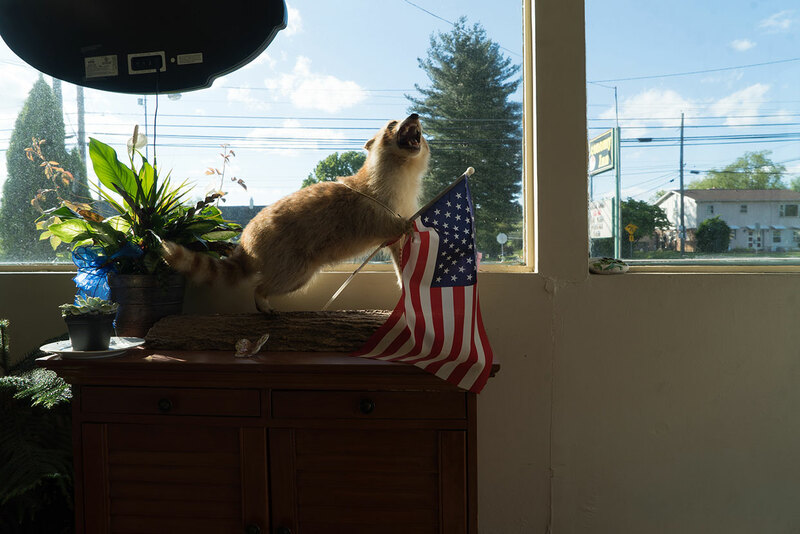 Then again the night after, when I couldn’t quite make Asheville, and ended up staying in a tiny Virginia town with a taxidermied creature perched in the front window, welcoming visitors in. After Asheville and corncob nights, I started to hit warmer weather as I rode south-west to Chattanooga. The two lane road rolled around a huge river with giant stones, passing through small rafting towns and MotoBike and I drifted between patches of sun and shade, always on the go. Hours later, I pulled into a small gravel lot behind a big home in Chattanooga in a quiet residential neighborhood. 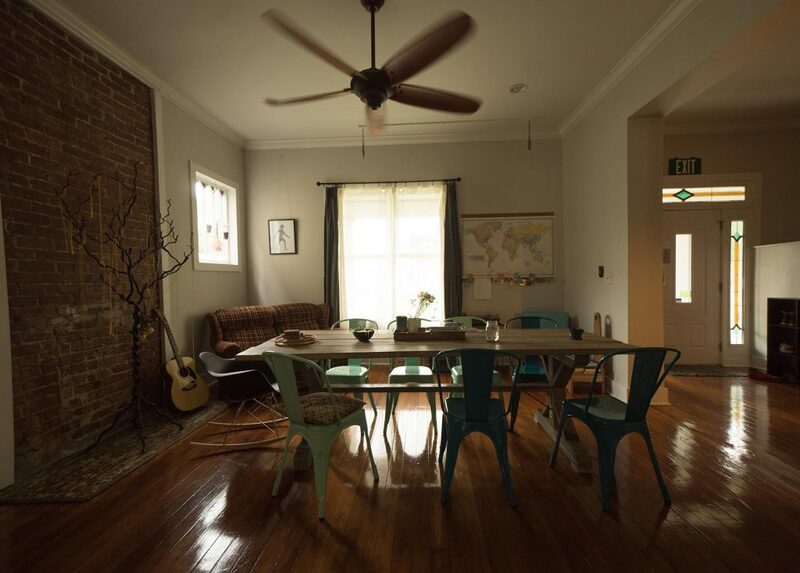 En Root House, a newer hostel in Chattanooga, looked beautiful, and I had always wanted to visit this small town and vibrant climbing community in Tennessee. Over the next three days (being delayed by a storm on the third day) I got to know the owners of the place— Lizzie and Cody, two young entrepreneurs who had gone to college together in the area, and ran a bicycle-powered coffee shop in Chattanooga before opening the hostel. Having a few beers at a local brewery and getting to hear their story was the highlight of the trip in Chattanooga. 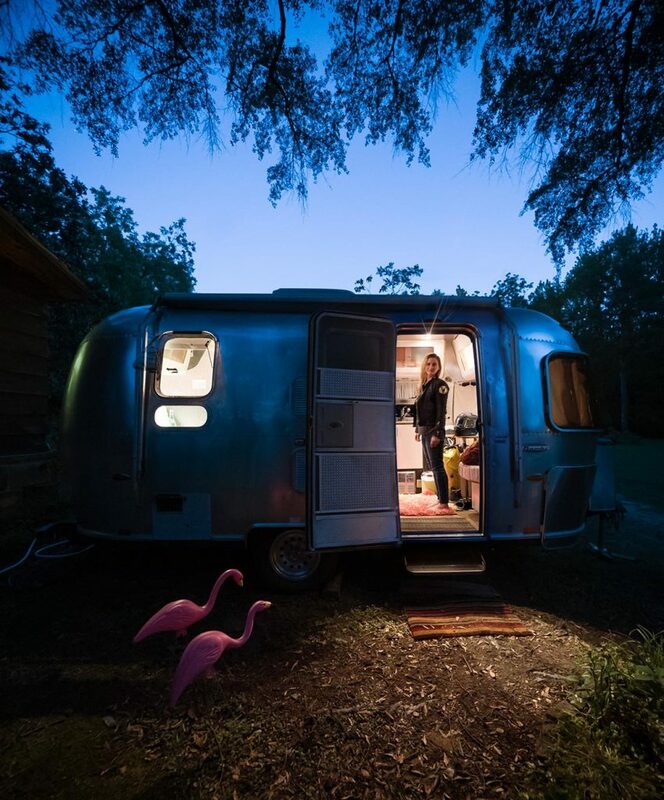 I rode through Alabama, stopping for the night in Tuscaloosa at arguably the best AirBNB listing I’ve ever seen— an Airstream with pink flamingoes in the front yard. The owner was the most wonderful southern lady who put fresh flowers on the table, and had stocked the place with a great assortment of tea, and worried about my safety as I rode off the next morning, New Orleans bound. I arrived in New Orleans yesterday evening over gleaming white roads criss-crossing waterways, only to be swept away immediately with a new group of people to a music festival in a park nearby. It’s been a whirlwind week, filled with many firsts, and amazing people and places. A week always seems like a month adventure traveling— that person you knew yourself to be before blurs at the edges, and makes room for the person you are becoming. I believe in fate, and the way our small choices influence daily the kinds of people we meet, and when, and how. That’s what love is isn’t it? 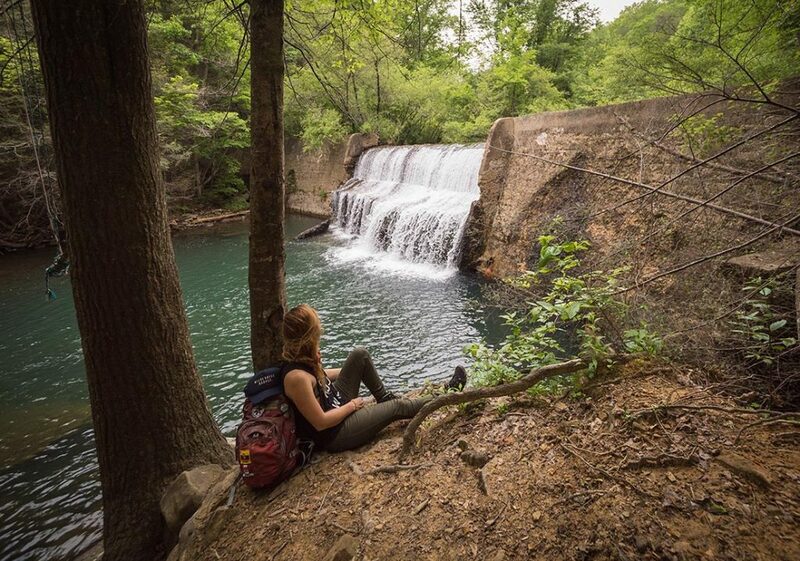 That give and take of energy, spread across this world, this life, this adventure.